Earn a six figure income. . .
Own a cosmetic business in a mall. Business license, insurance and registration fees. Fixturing, POS system, phone and supplies. Corporate training before launch, continued on-site training upon opening, and on-going sales support thereafter. $7,000 of the Flori Roberts cosmetics and skin care products of your choice. Be part of the nationwide phenomenon: selling popular brands in busy malls. Specialty Retailing magazine calls it "one of the best business opportunities available. . . similar opportunities cost $25,000 or more". Just One of Our Many Success Stories. . .
Ellaine Wilbon of Dumfries, Virginia is a Kiosk Superstar at Potomac Mills Mall. In her mid-20s, and a third year Kiosk Owner, Ellaine and her team do more than $500,000 in annual sales. That translates to approximately $175,000 in take-home pay for Ellaine a year — and growing. Ellaine is also driving a brand new company paid-for E350 Mercedes. Says Ellaine, "This is a great business. I'm grabbing a piece of the multi-billion dollar cosmetics industry. And, it's wonderful to see our clients brighten after we work with them. They look great. They feel great. And, they get lots of compliments." Qualified candidates will receive up to a $4,000 Grant paid for by Flori Roberts Inc. In addition, you get paid while managing a Flori Kiosk enroute to full ownership. CALL 1-800-606-3435 AND PRESS 2. 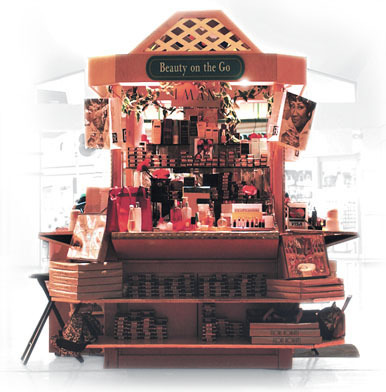 If a mall kiosk is your dream, we can help make it happen! Receive a free kit on how to earn six figures and have your start-up expenses paid-for. . . how to get started and earn your grant.